Kirsten Powers: "How Obama Blew It"
After enjoying Michael Rennie in a small role in last night's movie, I'LL NEVER FORGET YOU, I was inspired to get out DANGEROUS CROSSING, which has been in my "watch soon" stack for a few weeks now. DANGEROUS CROSSING is a fast-paced 76-minute thriller in which Jeanne Crain plays Ruth, a bride who embarks on a honeymoon cruise only to "lose" her husband -- and his luggage -- minutes into the voyage. There is no record that Ruth's husband boarded the ship, and most of the crew and passengers come to believe Ruth is crazy. However, the ship's doctor, Paul Manning (Michael Rennie), is compassionate and tries to help Ruth. Rennie is excellent as the calm, kindly doctor who finds himself attracted to the distraught woman he's trying to aid. Crain, one of my favorite actresses, is outstanding as the woman who might -- or might not -- be losing her mind. This is a tightly plotted and well-acted film. The supporting cast includes Carl Betz, Max Showalter, Marjorie Hoshelle, and Mary Anderson. Anderson, who plays the mysterious stewardess, had the small but notable role of Maybelle Merriwether in GONE WITH THE WIND. DANGEROUS CROSSING was directed by Joseph M. Newman. The score was composed by Lionel Newman. Longtime Fox photographer Joseph LaShelle shot the movie. LaShelle's credits include LAURA, FALLEN ANGEL, ROAD HOUSE, and COME TO THE STABLE. 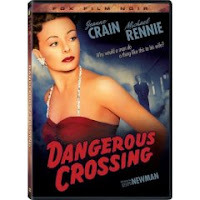 DANGEROUS CROSSING was released on DVD as No. 24 in the Fox Film Noir series. (I just purchased ROAD HOUSE, one of the newest Fox Noir releases, and Fox seems to have stopped numbering the series.) Extras include an excellent 9-minute featurette on the making of the movie, which was shot in only 19 days. The documentary includes comparison shots showing how the identical sets were utilized in the same year's TITANIC and GENTLEMEN PREFER BLONDES. One of the costumes was even recycled from the wardrobe of 1950's ALL ABOUT EVE. Regarding Jeanne Crain, it's a shame that her classic films MARGIE (1946) and APARTMENT FOR PEGGY (1948) aren't available on DVD. I'd also love the chance to finally see CENTENNIAL SUMMER (1946). She was delightful as the pregnant young wife of returning WWII veteran William Holden in APARTMENT FOR PEGGY. MARGIE is probably the best loved of all Crain's movies other than STATE FAIR, which did receive a beautiful DVD release as part of a tribute to Rodgers and Hammerstein. Check out the very high rating of 7.4 which MARGIE holds at IMDb. MARGIE deserves to be preserved and available to future generations of viewers. You can vote here to indicate interest in a DVD release of MARGIE, and vote here for APARTMENT FOR PEGGY. I just watched DANGEROUS CROSSING over the weekend and I loved it. It was so much better than I thought it would be. I'd never heard of this movie until I stumbled across it on Netflix a few weeks ago. I just checked my queue and it's shipping in a few days. How funny that we both are watching it about the same time. The plot sounds awfully similar to Jodie Foster's recent Flightplan. I wonder if they knew about Dangerous Crossing when they made Flightplan. I haven't seen Hitchcock's THE LADY VANISHES yet, but I think that plot may be similar too? Kind of a tried-and-true mystery plotline. Let me know what you think when you see it, Missy!